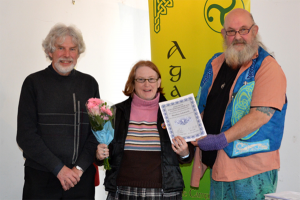 Saturday 14th February was the Agan Tavas AGM. More members than usual attended and four new members joined at the meeting. The Chairman reviewed the past year where the visibility of Agan Tavas had been increased. Clive Baker continues as Chairman, Ray Chubb as Secretary and Gareth Parry as Treasurer. Heather Ashworth was made an Honorary Life Member.